CSU DH appeals to a wide range of students, having achieved gender parity over a decade ago. Further, with a shift away from concentrations, CSU DH is moving towards a more flexible path that allows students to shape their degree to their own personal aspirations. What are the demographics of student that typically enrolls in California State University Dominguez Hill’s online MBA program? We have a very diverse class in the MBA program. The student profile (https://www.csudh.edu/mba/admission/student-profile/) shows how very diverse we are. Recently, USC made news for having gender parity but we at CSUDH have had gender parity for over a decade. Are students required to spend time on CSUDH’s campus in Carson, CA? No, our online program is completely online. Students are still welcome to come onto campus but all the resources students need are available online as well. 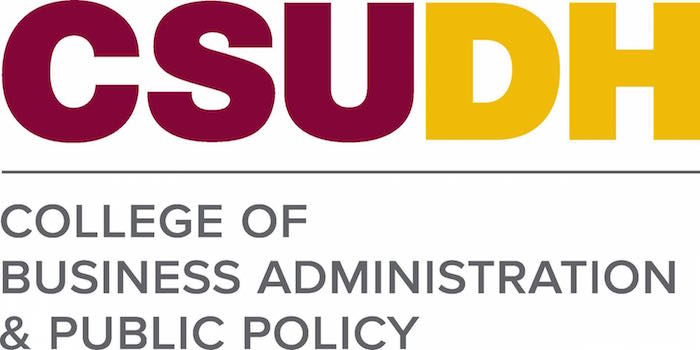 CSUDH’s Online MBA program is noted for elevating business professionals to leaders. What can a prospective student expect in terms of leadership learning in and out of the classroom? We encourage students to engage with each other. The best way to learn leadership is understanding how you operate and engage with others. Leadership is about the relationships students can build within the classroom through projects and assignments and outside the classroom by engaging students in social activities. Students work together in the classes they register. We have a core curriculum that all students share and they diverge when they choose to take their electives. Students engage with our faculty through the classroom environment online either through the activities or general discourse within the course. What is unique about the structure of CSUDH’s online MBA program? We offer the program year round and in 12 week sessions. We are able to let students finish their program in 18 months. The Career Center is open to all of our students. Students can opt to take resume counseling or interviewing skills workshops. With degrees in Finance, Management, International Business, Marketing Management, HR Management, IT Management and Global Logistics and Supply Chain Management , what is most popular with your MBA students and why? We are actually removing our concentrations, we are moving towards a MBA degree with no concentrations to allow greater flexibility to meet student demands. Please describe any opportunities for internships and/or international learning opportunities as part of the CSUDH Online MBA? Most of our students are full time professionals looking to advance their careers. We encourage students to take internships if it aligns with their professional career aspirations. I highly encourage students to engage with faculty and their peers while in the Program. In this new globalized economy and the advancement in technology, organizational dynamics have changed with remote workforce and flatter organizational structures. The online environment mirrors many of those aspects by having to navigate projects, deadlines, etc remotely and be able to develop strong teamwork skills to accomplish shared goals. Thanks to Betty Vu for participating. For more interviews, check out our Online MBA Report Interview Series.